To be released beginning on May 22, 2018. The release will be published in batches over a space of a week to ensure stability. So, some changes may not appear on your account for up to 7 days after the release date. The Version 6.2 release includes the following changes and enhancements. Previously, the only way to manage your account administrators was one a time within individual contact records. 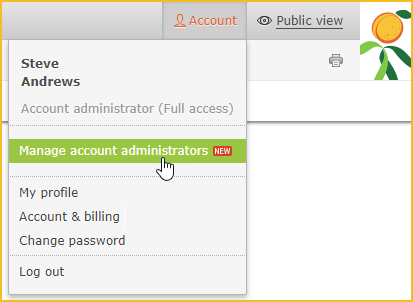 Now, there's a single Manage account administrators screen where you can view, add, modify, remove, and email your account administrators. 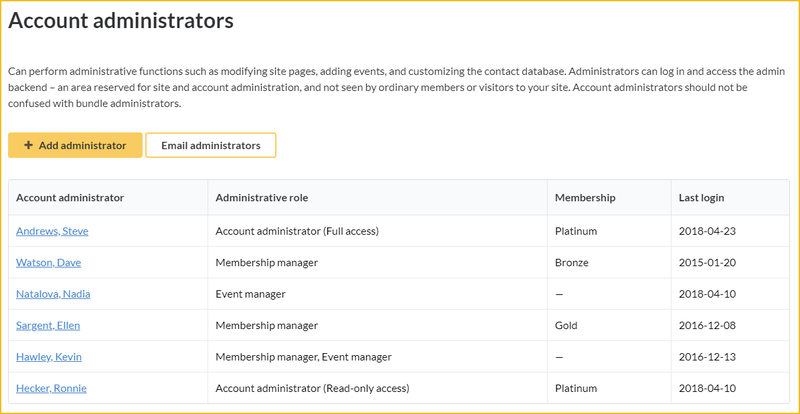 To display the Manage account administrators screen, hover over the Account menu in the upper right corner of admin view and select the Manage account administrators option. For instructions on adding, viewing, modifying, removing, and emailing account administrators from the Manage account administrators screen, click here. From the Account screen, you can now change the billing period for a monthly plan yourself, instead of having to email Wild Apricot's billing department. You can change the billing period from monthly to yearly (for a discount of 10%) or every two years (for a discount of 15%). This self-service option for changing your subscription period is only available for monthly accounts, and is not available for locked in and overdue accounts. To change back to a monthly plan, or to switch between yearly and every 2 years, you need to email billing@wildapricot.com. 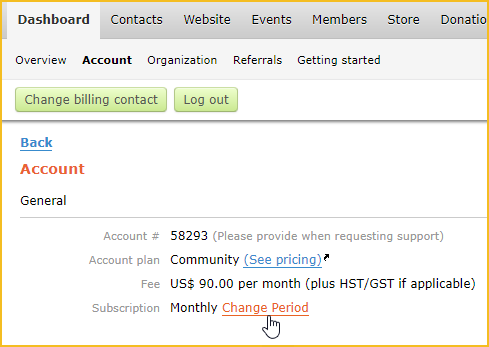 To change the billing period for a monthly plan, go to the Account and billing screen and click the Change period link beside the Monthly description of your subscription. You'll be asked to choose a new subscription period and to confirm the change. Once you confirm the new subscription period, we'll send a summary of the account change to your billing contact. On your next monthly renewal date, you'll be charged the annual or 2-year fee.